Rome (Agenzia Fides) - H.E. 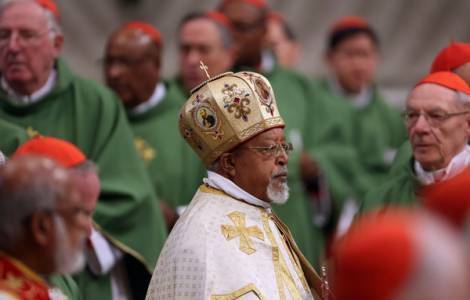 Berhaneyesus Cardinal Souraphiel, the Metropolitan Archbishop of Addis Ababa said that the international media portrayal of "youth migrating to different areas of the Middle East and Europe only counts for 20%, while 80%, which is the great migration and displacement of the youth, is within Africa". He disclosed this while giving his presentation at the Bishops' Synod on the Youth. Cardinal Souraphiel argued that "the lack of governance" is the cause that drives young Africans to leave their Country and also due to factors such as "corruption, conflicts and civil wars and liberation movements supporting this or that side". This is coupled with the fact that, "the great trade in the world, the arms trade, is really big business in Africa whereby arms are coming from Europe, America, China, and some of developing countries".